« A Social Experiment: Listening to music or drinking coffee- What’s more common for the daily San Francisco pedestrian commuter? With these consecutive titles, the discussion of how far can Nadal go is reigniting—a requisite inclusion in any article chronicling his Wimbledon championship (see Bruce Jenkins article, and Greg Garber’s article here). With Nadal’s 8th Grand Slam championship, he’s now halfway to Federer’s total of 16. It’s time to take a renewed look at his current and possible future performance compared to historical legends and update my posting last year about Nadal’s candidacy for GOAT. 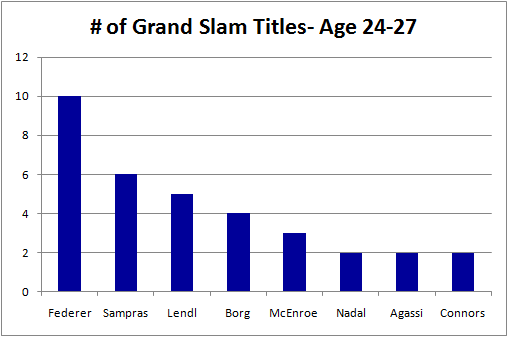 This analysis is focused on grand slam titles by age group. Last year’ post about Nadal as well as my posting about Federer’s candidacy as best ever after winning the 2009 French Open have additional metrics to consider, but ultimately, the bottom line statistic that the media and the public will use is # of Grand Slam wins. (Note: this is statistical analysis only, it doesn’t consider quality of competition or players prior to the Modern Open era). In trying to foresee what Nadal’s career records could end up, I again analyzed performance by Age group—through Age 23, Age 24-27, Age 28-31, and Age 31+. for the top modern era players. 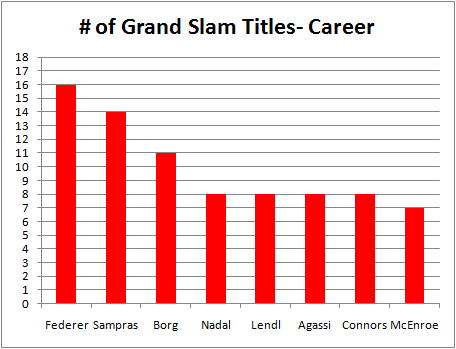 Below you’ll see, current career Grand Slam titles for top players, with Federer’s 16 and Sampras’ 14 leading the way. Nadal turned 24 this year, but clearly his performance through Age 23 has been consistent with those in the conversation for best of all time. His 6 Grand slams, put’s him just behind Borg, but slightly ahead of Federer and Sampras. 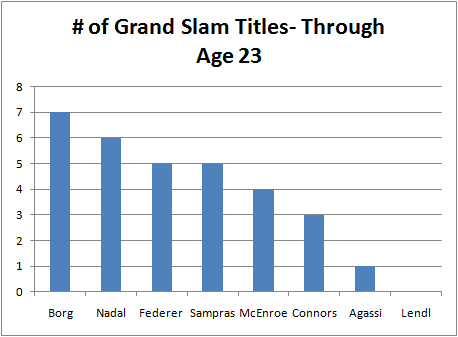 The next age group of titles between Age 24 and 27 is where Federer has really shined. Now, 28, Federer won 10 Grand Slams during this period, 4 more than Sampras. Nadal, with today’s Wimbledon victory and still only 24, is on a good trajectory here with now 2 Grand Slams during this period during his first two months of being 24. 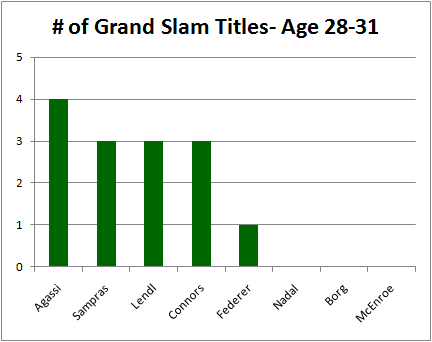 From Age 28-31, top flight performance certainly starts to decline, with Sampras, Lendl, and Connors earning 3 Grand Slams and Agassi leading the way with 4 Grand Slams. Agassi is certainly an anomaly, as no other top player had more titles in this age group than they had won in their younger age groups. By Age 31, championship careers basically end. Only Agassi even won a single Grand Slam after this age. What’s the best comparison for Nadal the rest of the way? Let’s face it, Federer’s 10 titles during his 24-27 ages won’t easily be reached. Even with his 2 titles so far in his 24th year, Nadal would have to win 8 of the next 14 Grand Slams to equal that. That’s a tall order to fill for even Nadal. But if he can reach a more achievable level of Sampras’ success of 6 titles or slightly better than Sampras at 8 titles during this time (age 24-27), he would by the end of his 27th year have 12 to 14 Grand Slams. To me, 14 titles by the end of this age group is likely the best case scenario. If he enters his 28th year on earth with 12-14 Grand Slams, if he can achieve success like Agassi during his 28-31 years with 4 titles, he could surpass Federer’s current total of 16 titles. But earlier, we said Agassi’s success later in his career was an anomaly. It just doesn’t happen often. So, let’s say he hits the next best success level of 3 titles that Lendl, Connors, and Sampras reached during this age group—that would give him between 15-17 titles. 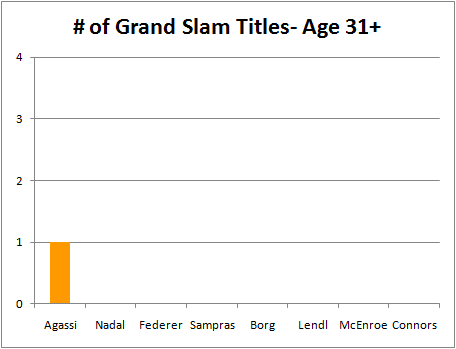 Now we’ve seen that only Agassi won a a Grand Slam at 31 or later. So, we’d have to assume that Nadal wouldn’t either and Agassi continues to be the anomaly. So, in summary, the model to look at from this point on for Nadal is Sampras. If Nadal can slightly surpass Sampras level of success during similar ages the rest of Nadal’s career, then he has a shot of hitting Federer’s current level of 16 titles (win 6 titles between 24-27 and 3 between 28-31). How can Nadal surpass Federer’s projected career totals? Of course, this is in comparison to Federer’s current number of Grand Slams. What if Federer wins additional Grand Slam titles? Federer is now 28 and he has won 1 Grand Slam so far in his 28th year. His level of dominance is starting to fade—his record of 23 straight Grand Slam semifinals has ended and he has lost in the quarterfinals during the last 2 Grand Slams. But if we give him the benefit of the doubt, and say that he too equals Sampras, Connors, or Lendl’s success during this age group, he’d win 2 more Grand Slams over the next 3+ years. That would mean he ends his career at 18 Grand Slams. So, Nadal would have to perform better in the 24-27 or 28-31 age group than Sampras to equal or surpass Federer’s projected final totals. Given Nadal’s all out style, it’s unlikely he’ll be in physical shape to do it during his 28-31 years—I don’t think he can replicate Agassi’s performance in his later years. Thus, Nadal will have to totally dominate during the rest of his 24-27 years. So, far he’s doing that, having won the French Open and Wimbledon in 2010. And with Federer starting to fade, you can see him winning US Opens as well. He would have to dominate the way Federer excelled during his years in this age group, he’d need to win 10 or more Grand Slams. Possible but unlikely in my opinion. At the end of the day, I’d still suggest that Federer’s career will stand up as best ever statistically ( in terms of Grand Slams won) when he’s done and that Nadal won’t surpass him. Of course, this is all conjecture and speculation, but grounded on historical analysis. For Nadal to exceed Federer, he’d have to equal or surpass Federer’s unmatched performance from age 24-27 or have the best performance ever between age 28-31. Too difficult to count on either of those. But it will be fun to watch—I’m sure Nadal will make it interesting! dont know either if rafa will make it but it will be interestinmg to watch, for sure! @ Diego– thanks for the comment. Yes, it will be interesting, although I do think even if he’s fit, the chance of catching Federer will be very difficult and unlikely. Certainly less than 99% in my opinion. But if he dominates the next 2 years, then he may have a chance to do it. Winning consecutive French Open and Wimbledon’s is a good start for him. @ Chris– thanks for the comment. Yes, his style will be an injury risk and makes it difficult to foresee the longevity in his career. So, I think we’ll need to see the yearly Slam from him this year or next year to think he has a chance at Federer’s ultimate record. I read your article– very nice. I’ll post a comment on your blog with more thoughts. Keep it up. Of course if Nadal participates in every tournament the way his uncle Toni foolishly scheduled for him to play at the first half of 2009, he will have knee and other physical problems again. However I think his people have wised up. They won’t let him play back-to-back tournaments anymore because that’s the best way to get his tendinitis flared up as it happened last year. If Nadal skips every other tournament and mostly concentrates on Grand Slams, I think he will be healthy all the way to the age 29-30. And if this happens, unlikely there will be anyone who can beat him. @ Cuong– even if he reduces his tournament load and avoids reoccurence of tendinitis, to be highly effective to age 29-30 in terms of being able to win grand slams is going to be very difficult. Hasn’t happened that frequently. We will see.